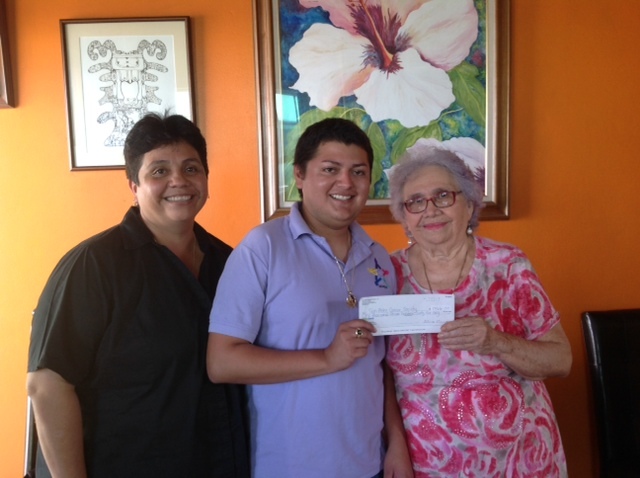 Press Release – San Pedro Cancer Society – May 19, 2014 – The San Pedro Cancer Society, in collaboration with Staines Enterprises LTD and Elvi’s Kitchen would like to inform its supporters and customers (respectively) that the first handing over of much needed funds to the society was carried out today. At our last banquet, Elvi’s Kitchen made the great commitment of asking their customers for a minimum of one dollar in Belizean currency. It is with the most heartfelt gratitude that the San Pedro Cancer Society boasts of the first contribution for the month of April, 2014 to mid-May 2014, which allocated to $1366BZ. This first contribution will greatly assist us in furthering the goals of our cancer society and its patients. Cancer has devastated many of our friends and relatives in this small island community, it is so good to know that we have many of these same people fighting back and helping us eradicate cancer. We are glad that Elvi’s Kitchen has become a second home to our group. Thank you Elvi’s! Thank you San Pedro! Elvi’s Kitchen celebrates 40 years of great food and service!